While shoveling in my white world on this weekend it occurred to me that a quilt was needed. The snow trees seemed to be calling for there to be pictures on their branches. This is a very old "rescue"quilt I was given years ago. It had been patched with polyester knit fabric and nothing of today's quilt was showing. It was in a pile of blankets and likely would have been discarded. It was well worn. After much thread picking what I found was gorgeous. All cotton, lovely workmanship and hand quilted. And it showed its age. It must have provided much warmth and coziness over the years. I use it mainly for display especially during Christmas time. I have always loved red and white quilts because they are so striking in their simple use of color. Someday I might just stitch one. Everyone is a little nutty in their own special way. 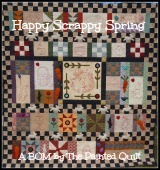 So please join us for the "NUTS ABOUT " blog hop sponsored by Seams To Be Sew on February 4. Wishing everyone cozy stitching and a warm quilt to snuggle in.